*****The products offered by Steep Me a Cup of Tea or SteepMe.com are not intended to treat, cure or prevent any illness or disease. If you have or suspect that you have a medical problem, consult with your physician for diagnosis or treatment. Use herbs as per instructions and always watch for any allergic reactions. You should always carefully read all product packaging and labels. Always consult your physician or health care provider before using any herbal products, especially if you have a medical problem. Steep Me a Cup of Tea or SteepMe.com and/or its proprietors assume no liability for any injury, illness or adverse effects caused by the misuse and/or use of the information or products presented. Great combination of teas to help with the cleanse process….works well with positive changes in diet and exercise. We recommend using this tea sparingly. An ounce will give you approx 8-10 drinks. We recommend that on the first day of cleanse…do a tea before bed. The following days do a mid afternoon tea and a night time tea…this will help get the detox process going. Please don’t hesitate to call and ask questions. Adrenal Tonic is a great remedy tea for a fatigued Adrenal system...these hand crafted herbs combine to allow your adrenal system to restore and repair for better recover and reduced stress. Not Safe for Pregnancy or Breastfeeding Sencha green tea with organic and wild crafted herbs of Rosemary, Bacopa, Gingko and Ginseng. 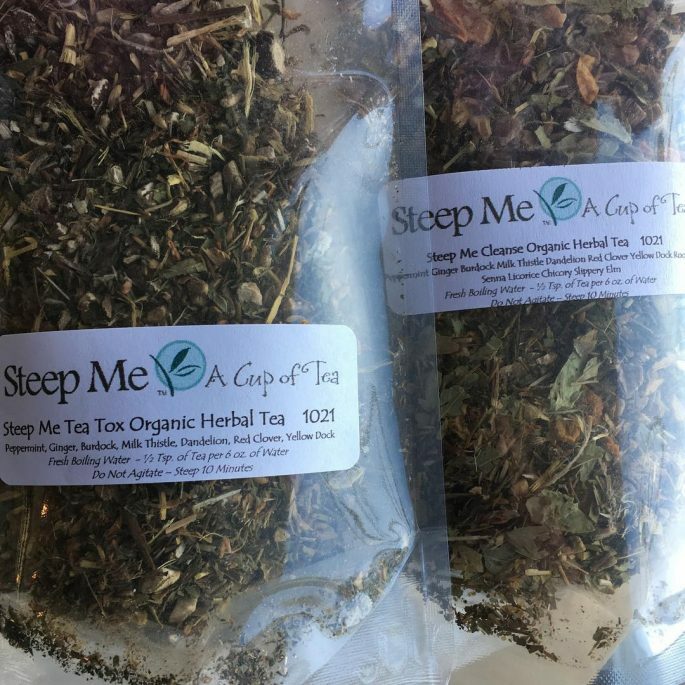 *****The products offered by Steep Me a Cup of Tea or SteepMe.com are not intended to treat, cure or prevent any illness or disease. If you have or suspect that you have a medical problem, consult with your physician for diagnosis or treatment. Use herbs as per instructions and always watch for any allergic reactions. You should always carefully read all product packaging and labels. Always consult your physician or health care provider before using any herbal products, especially if you have a medical problem. Steep Me a Cup of Tea or SteepMe.com and/or its proprietors assume no liability for any injury, illness or adverse effects caused by the misuse and/or use of the information or products presented. (Good For Nausea – safe for pregnancy) Wild crafted herbs of Apple, Lemon Peel, Lemongrass, Peppermint, Ginger, and Fennel *****The products offered by Steep Me a Cup of Tea or SteepMe.com are not intended to treat, cure or prevent any illness or disease. If you have or suspect that you have a medical problem, consult with your physician for diagnosis or treatment. Use herbs as per instructions and always watch for any allergic reactions. You should always carefully read all product packaging and labels. Always consult your physician or health care provider before using any herbal products, especially if you have a medical problem. Steep Me a Cup of Tea or SteepMe.com and/or its proprietors assume no liability for any injury, illness or adverse effects caused by the misuse and/or use of the information or products presented.